The Cadillac Three released Dang If We Didn't that qualifies as a Country rock tune . 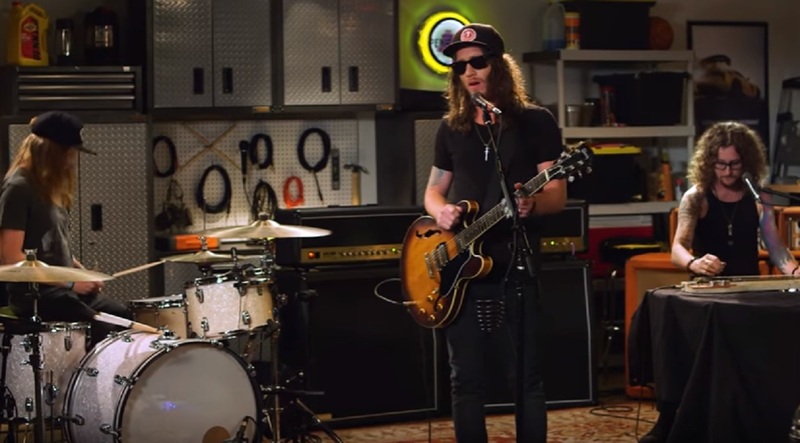 . .
Watch the Southern country rock group The Cadillac Three perform their rollicking tune Dang If We Didn’t and check out the lyrics to the song below. The Nashville based country southern rockers performed “Dang If We Didn’t” for the Pennzoil Garage Sessions and you can tell this trio is into cars from the garage backdrop for the music video. The trio also chat about the wheels that got them started and the origin of their band name. Born and raised in Nashville, Tennessee, the trio of singer-guitarist Jaren Johnston, lap-steel player Kelby Ray and drummer Neil Mason all share common roots in their spirit and music influences. The Cadillac Three started out originally as the Cadillac Black. They later signed with Big Machine Records. The trio released their first LP under the Cadillac Three banner, Bury Me in My Boots. The song “Dang If We Didn’t” will appear on their follow-up album, Legacy. “We started the Legacy album the day Bury Me In My Boots came out last August because there were some songs we were excited about and we wanted to jump in the studio and do what we do live for a minute — to see what would happen,” says drummer Neil Mason in a statement. “We didn’t really tell anyone what was up and by the end of the year we had cut the whole album and produced it ourselves.” Legacy arrived via Big Machine Records on August 25th. The lyrics to Dang If We Didn’t were written by Jaren Johnston, Neil Mason and Jonathan Singleton. Pair of Levi’s on a ceilin’ fan, spinnin’ / Like my head one boot on, a beer in the other / That what the hell settin’ in / Gone and dang done it again / Pack of Reds by the bed / And we don’t even smoke. Dang if we didn’t get drunk last night / What was so wrong, we had to make it so right / Whiskey, ‘quila, rum, and some cold Bud Light / Dang if we didn’t get drunk last night. I remember my baby dancin’ that was the beginning / Of the end of a nice quiet night at the house / Called some friends, called a cab / Got a table, got a tab / We were shootin’ shots, shootin’ the bull / Shootin’ pool, it’s all comin’ back now. Check out The Cadillac Three Tour Dates and see if the trio is visiting a city near you.